We are often asked about what products we recommend for the best dental care. We thought we would compile a list of the products that we use on a daily basis. Feel free to contact us should you have any further questions….we are always happy to help! The tape will clean between the teeth and help to improve your oral health. It is smooth and covered with fluoride. Fluoride will strengthen the enamel and combat dental decay that is developing between the teeth. It also tastes good! We love electric toothbrushes! Look out for the following qualities: rotating, pulsating, round headed. All basic oral B brushes will have these qualities. We can guarantee that your teeth will feel cleaner immediately! Any toothpaste that contains fluoride is good as it will strengthen the enamel.Good and strong enamel is a starting point for cosmetic dentistry often. These can be described as rubbery tooth-picks. It can take a few attempts before you get the technique right with these ones, and they do tend to bend in the beginning. They are easy and quick once you get used to them. They are also perfect for cleaning underneath fixed retainers. Please ask your dental practice or clinic about purchasing these. Fluoride strengthens the enamel and prevents dental decay. 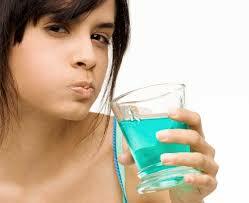 Use mouthwash twice a day after brushing. Make sure that you do not eat/drink/rinse for one hour following use. It tastes good and is not too strong.